1. What's the best time to order my wedding invitations? 2. When should we mail out wedding invitations? 3. Whose names should be included on the invitations? 4. Are response cards necessary? 1. What's the best time to order my wedding invitations? Invitations should be ordered at least four months prior to the wedding. Engraved and letterpress invitations should be ordered around four to five months in advance. 2. When should we mail out wedding invitations? Invitations should be mailed on average 8-10 weeks before the wedding. 3. Whose names should be included on the invitations? 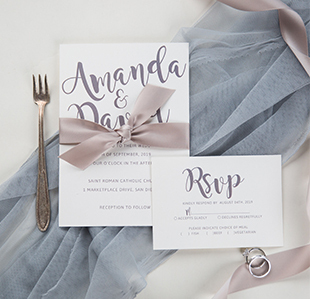 Traditionally, only the bride's parents' names are listed at the top of the invitation, especially if they're hosting and paying for the entire event. However in recent years both parents have been included . 4. Are response cards necessary? Reply sets are a necessary evil for any first-time wedding of over 50 people or more. There are ways to lessen the ”fill-in-the-blank” look of the r.s.v.p. card while still providing a practical means of response. You can also tell your guests to reply by email or phone. 1. What cardstock do you use for the invitations? 2. Can I upgrade the paper of my invitations? 1. What cardstock do you use for the invitations? Signature: A thick and luxurious stock in an off-white hue with a creamy cotton texture, usually reserved for fine stationery. 120lb, 17 point thickness. Pearlescent: Adds a subtle shimmer finish and rich look to cards, and a soft glow to photographs, for the ultimate in elegance. 98 lb., 12 point thickness. Double Thick: A thick and luxurious stock in an off-white hue with a creamy cotton texture, usually reserved for fine stationery. 230lb, 30 point thickness. Kraft Paper: This delightful earth tone paper has a beautifully smooth texture. 100lb, 12 point thickness. 2. Can I upgrade the paper of my invitations? Yes. You can pay to have your invitation paper to be upgraded. If you have any questions, please contact us at service@stylishwedd.com. 1. What does the price include? 2. Can I cancel the order after it reaches you? 3. What methods of payment do you accept?4. What should I do if I want to make any changes? 5 Can I customize the color or size of an invitation shown on screen? 6. Can you print other foreign languages besides English? 7. Can I add some additional information on the response cards? 8. Do you do other cards besides wedding invitations? 1). If you order wedding invitations, you will get free outer envelopes. 2). Please note, our prices are in US dollars. If you are from Canada, Australia, or European countries, when you go to checkout, it will automatically be converted into the currency in your own country according to the current exchange rate. 2. Can I cancel the order after it reaches you? Yes, if you dislike our e-proofs or the quality of our service BEFORE we print your order, then you will be able to cancel your order and receive a refund. However, due to the fact that our designers have spent time on the design of your order, $15 will be deducted as a design fee when we provide you the refund. If you haven't received the eproofs yet, you'll receive a full refund. We accept Paypal, Visa Card, MasterCard, DiscoverCard, American Express, E Check (Note: If you use E-Check, the process will take up to 4 business days due to the clearance process.) and Western Union (Note: If you wish to use Western Union, please contact us for further information). 4. What should I do if I want to make any changes? You can email us or call us to make changes. Five complimentary rounds of revisions are included with your package and we'll spend as much time necessary working with you to perfect your invitations! Nothing is printed until we have your final proof approval. If you want to make another change after you have confirmed the e-proofs in email, please contact us immediately and we will check the status of your order and let you know if a change can be made. Please note additional fees may be required to stop your order for requested changes. We will do our best to make any changes before your order is printed. However, due to our fast turn-around time, we cannot guarantee that we will be able to intercept or change any order once it has reached our factory. Thus, it is important that you make sure your order is correct before you confirm your e-proofs. 5 Can I customize the color or size of an invitation shown on screen? Yes. We can customize the invitations for you according to your requests. 6. Can you print other foreign languages besides English? Yes, it is a free service, however we do require you 'the customer' to provide us with the wording and verses before or after you place the order and will take responsibility for any mistakes, therefore we do ask you to check your verses thoroughly before submitting to us. 7. Can I add some additional information on the response cards? Yes, we will happily change the wording on the response cards. You can either add some additional information onto the response card or change the entire wording. The changes are free of charge. You just need to write clear instructions in the comment section of the order page when you place the order. 8. Do you do other cards besides wedding invitations? 1. What shipping methods do you use? 2. How much does shipping cost? 3. Can you ship to a P.O. BOX address? 4. Do I need to sign my order? 5. How can I track my order after it has been shipped out? 6. Can you ship orders overseas, how long will it take for me to receive it? 7. I need my cards as soon as possible. Do you take rush orders? 8. Do you send samples? 9. What is your return policy? Shipping is $15 to United States, Canada when you place an order of wedding invitations. We can ship to other countries as well, such as Australia, New Zealand, UK, Ireland, France, Germany, etc. If you are from another country outside of US and Canada, then $25 will be added to your order as shipping fee automatically when you place the order. We can ship orders to all the countries in the world. Once you place an order, we will email you proofs within 36 hours. After you have confirmed to print, you will receive your order within 6-7 working days. In order to ensure that your items arrive in time for your event, please use the following calculation to determine the estimated date you’ll receive your order:(Processing Time) + (Shipping Time) = Estimated Delivery Time. Processing Time: the period of time from when you submit your order to when the order leaves the warehouse. In this period we may contact you to confirm order details or prepare your custom order product. It usually takes about 1 – 3 working days. Shipping Time: the period of time from when the item be shipped by FedEx/UPS/DHL to when it arrives at your door. It usually takes about 2 – 3 working days. Estimated Delivery Time: The total period of time from when you approve the proofs to when you receive your wedding invitations. It usually takes about 5 – 6 business days.